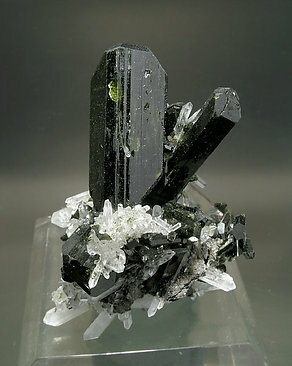 Group of crystals, two of them doubly terminated and exceptionally aerial, esthetically mixed with Quartz crystals. Also they are very bright. 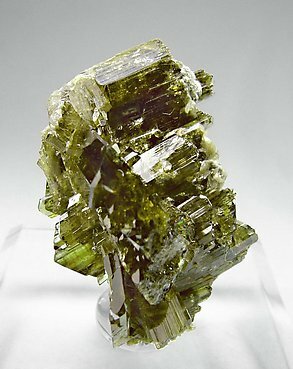 Group of really huge crystals, one of them doubly terminated, with an extraordinarily deep green color and very intense luster, with some Quartz crystals and on matrix. Extraordinary sample, an American classic. 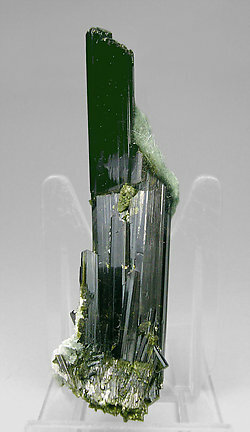 Fanlike aggregate of crystals with a very elongated prismatic shape and acute and very bright pyramidal terminations. With some small Quartz crystals. Both the crystal morphology and the type of aggregate are different than usual for samples from Prince of Wales Island. 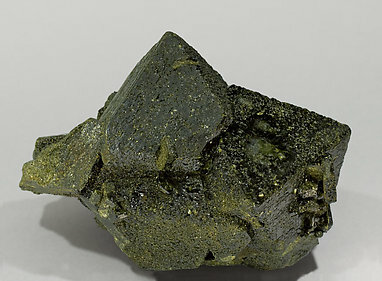 Parallel growth of well defined and bright Epidote crystals, some of them doubly terminated, with an intense green color. The specimen was purchased by Folch from Joseph Levy, in Disla (Disentis, Switzerland) in 1949, as is indicated in the Folch collection card Nr. 4.812 which we will send to the buyer. An excellent piece from Imilchil with typical fan growths, of a very good color and especially bright. 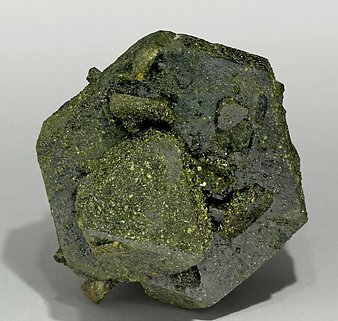 The sample comes from probably the most classic locality for Epidote. Crystals, prismatic and very thin, are grouped in a very disordered way but very esthetically. The piece is a floater. 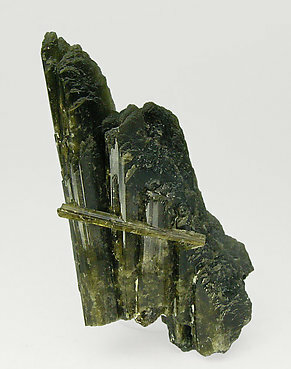 Group of very sharp Epidote crystals, with a well marked luster and transparency, accompanied by fibrous Actinolite and on matrix. This locality is probably considered the most classic for the species. A Swiss classic with two very well marked phases of crystallization, the first one as a basic single prism having very well defined faces and edges and the second as a polycrystalline termination with a parallel growth of transparent and bright crystals. The quality of the sample is good for the locality. From a very uncommon locality, an Alpine classic. The crystal, a floater, has a termination of partially chloritized faces and the other healed. Good color and luster. 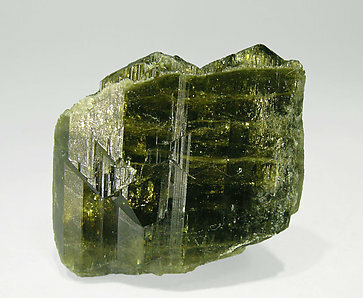 Transparent crystals of Epidote on matrix, many of them doubly terminated, with an intense green color and very bright. An excellent Swiss classic. A novelty at Sainte Marie-aux-Mines 2011. 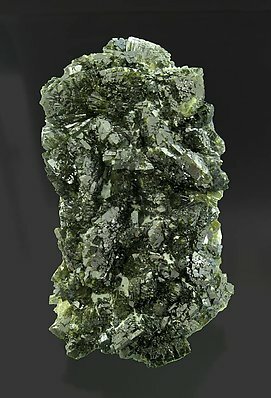 Group of crystals, of pistachio green color, with very simple forms but with a very uncommon habit, the predominance of a very well developed frontal pinacoid that results in the crystal being really smooth. 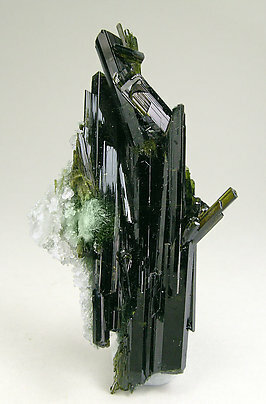 The crystals are bright and deep green, almost black. A novelty at Sainte Marie-aux-Mines 2011. 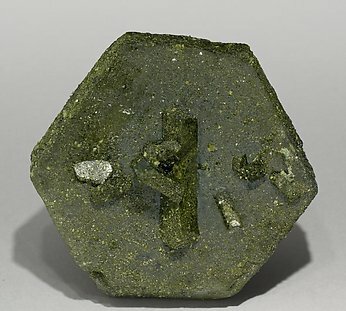 A floater crystal of green pistachio color, with very simple forms but with a very uncommon habit, the predominance of a very well developed frontal pinacoid that results in the crystal being really smooth. A novelty at Sainte Marie-aux-Mines 2011. Floater group of pistachio green color but with a very unusual habit, pseudo-octahedral, and with a feebly developed frontal pinacoid. Parallel growths with very well defined faces and edges. The piece is from an uncommon locality. On Folch’s autographed label it is mentioned that it was acquired in Switzerland in 1948. 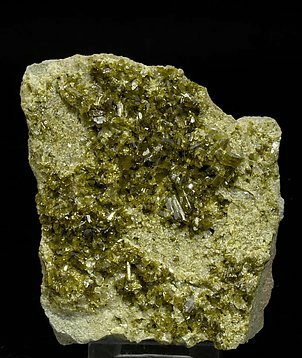 Very aerial parallel aggregate of very sharp crystals, between transparent and translucent, extraordinarily bright and with a deep an intense color, typical of this classic Austrian locality. A miniature of great quality. 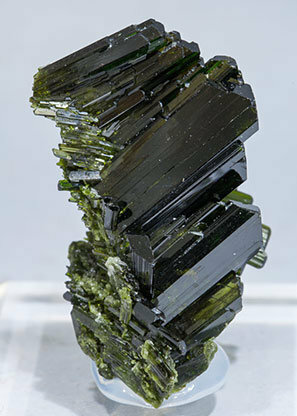 Fanlike groups of prismatic crystals of very well defined faces and edges and smooth terminations. They are with white translucent crystals of Albite, typical of alpine Epidote. 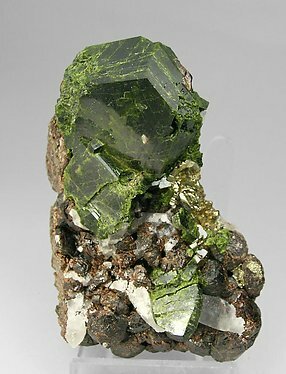 Flattened crystals of Epidote, one of them clearly dominant, with very well defined faces and edges, of typical pistachio-green color, deformed Quartz crystals, rounded crystals of Andradite and curiously shaped Pyrite crystals, on matrix. 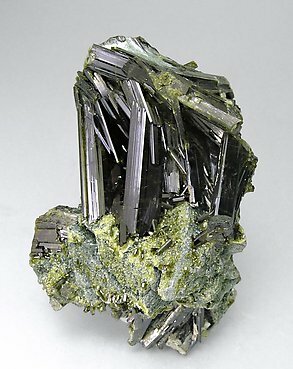 Fan-like growths of strongly flattened Epidote crystals, darker at their center and clearer on the edges. 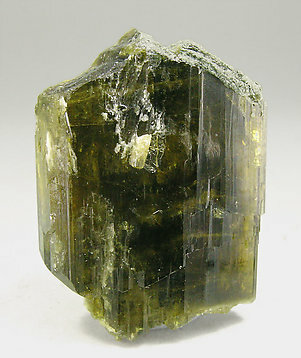 They are with sharp, translucent, bright and doubly terminated Axinite-(Fe) crystals. A novelty in Ste. Marie 2009. 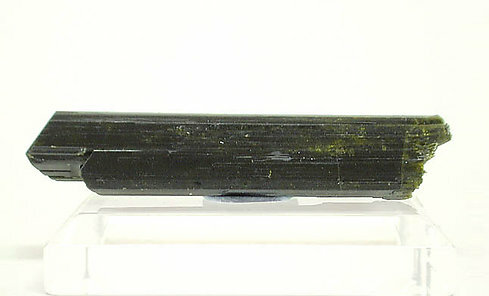 Group of crystals, most of them doubly terminated, of excellent transparency and luster and a very deep color. 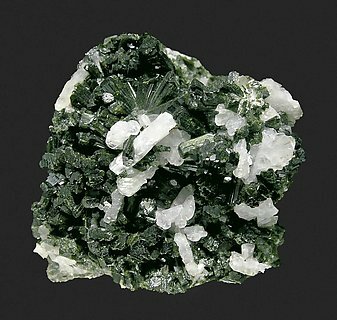 They are on matrix, with Actinolite (Byssolite). From a recent find in probably the most classical locality for the species. A novelty in Ste. Marie 2009. 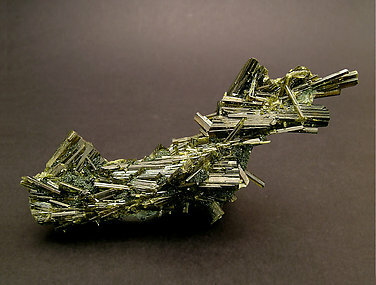 Excellent sample, a group of long prismatic crystals with very good terminations. They have notable transparency and luster, and a very deep color. 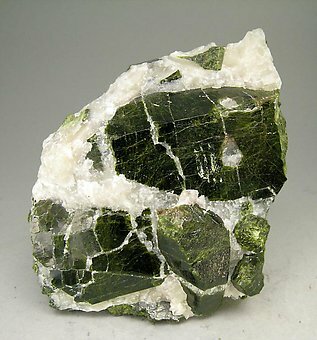 They are on matrix, with Actinolite (Byssolite). We must point out the very noticeable bending of the main crystal at the left, with a continuous curvature on the center one. From a recent find in probably the most classical locality for the species. 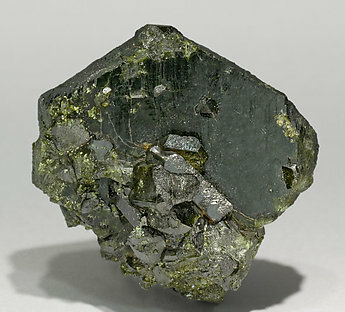 An esthetic specimen from a classic locality in which Epidote is uncommon. 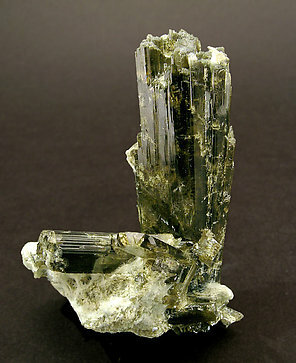 Crystals are prismatic, well terminated and some of them are transparent. 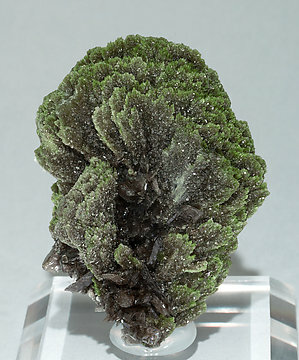 They are in a matrix with a fibrous silicate, probably Actinolite, variety Byssolite. The specimen was purchased by Folch from Joseph Levy, in Disla (Disentis) in 1949. 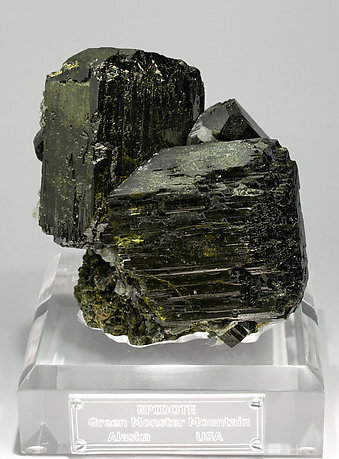 Thick crystals of Epidote of considerable size, with very well defined faces and edges, partially included in Calcite and on a rich Andradite matrix. 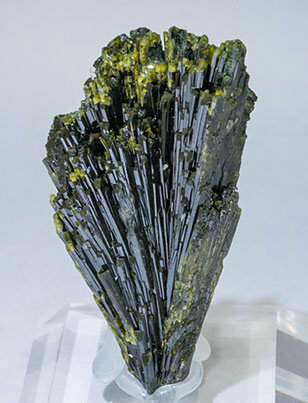 One of the few samples of quality collected in the Aguablanca mine. Radial groups of small acicular crystals of exceptional color, luster and transparency. 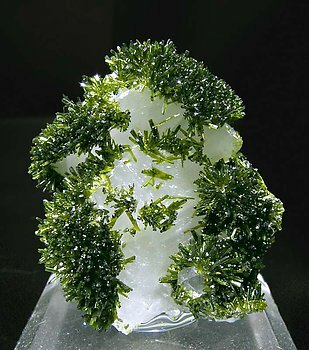 The matrix is formed by tabular crystals of Calcite. The sample is very esthetic.